Get your kids in the kitchen and make a batch of these yummy and nutritious fries together. Recently, I was asked to participate in the new Be More Here campaign by Dixie®. This campaign is all about the importance of spending time with family and friends and being present in the moment. It’s definitely a topic that I can relate to. When it comes to spending time with loved ones, it’s all about quality, not quantity. As a working mom, I often feel stretched for time. So I really value the time I have with my daughter Sienna, especially when I see how quickly she is growing every day. stacking my mixing bowls and crushing eggs. As much as I love to have her in the kitchen with me, my kitchen often looks like a disaster zone afterwards and I’m usually dreading the thought of cleaning up. Using Dixie® plates allows me to focus on spending quality time with Sienna, rather than worrying about all of the time I’m going to spend washing dishes afterwards. Dixie® plates are also extremely practical when cooking with a toddler. Sienna and I recently made a batch of zucchini fries, which involved setting up a breading station with flour, eggs and breadcrumbs. Dixie® plates were the perfect and safest choice for this. I didn’t have to worry about Sienna breaking any plates or hurting herself. I set up the breading station and let her go to town! Of course, half of the flour and breadcrumbs ended up on the floor but that’s part of the process when cooking with a two-year-old! We ended up with a whole tray of yummy zucchini fries- some prettier than others. After a spray of olive oil and a quick bake in the oven, these nutritious fries were ready to be devoured! Spending time with my daughter, cooking together, watching her experience things for the first time- it’s moments like these that matter the most. Preheat oven to 425°F. Place a cooling rack on a baking sheet and spray or brush it with olive oil. Prepare your breading station. Place the flour on a plate or shallow dish. Mix the egg with 1 tablespoon water in a second dish. In a third dish, mix the breadcrumbs, Parmesan, Italian seasoning, garlic powder, and salt together until well combined. 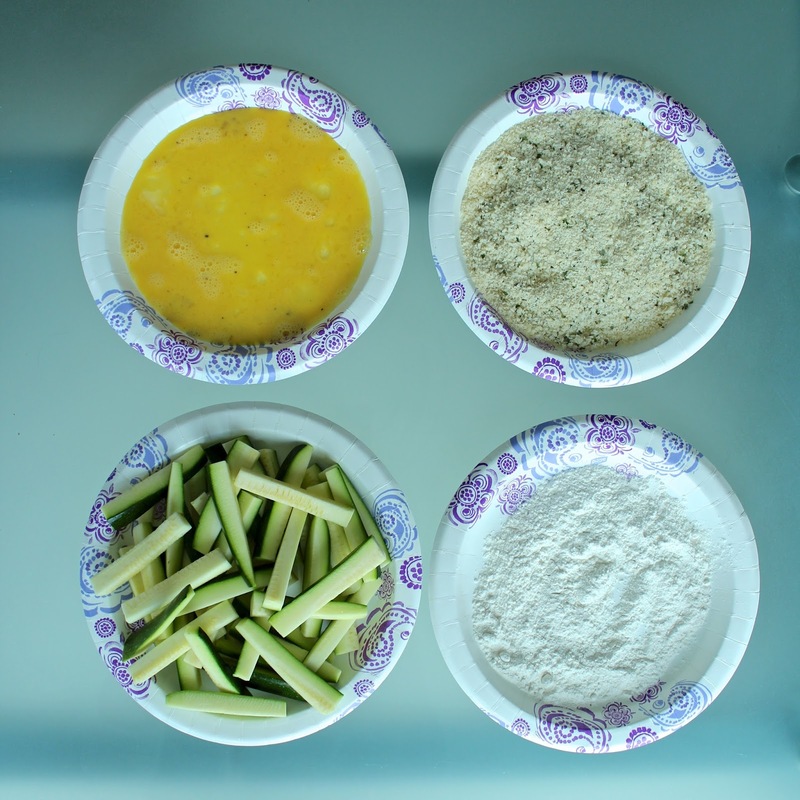 Working in batches, dip the zucchini into the flour, shaking off any excess. Then dip into the egg and finally the breadcrumbs, coating all sides well with the mixture. 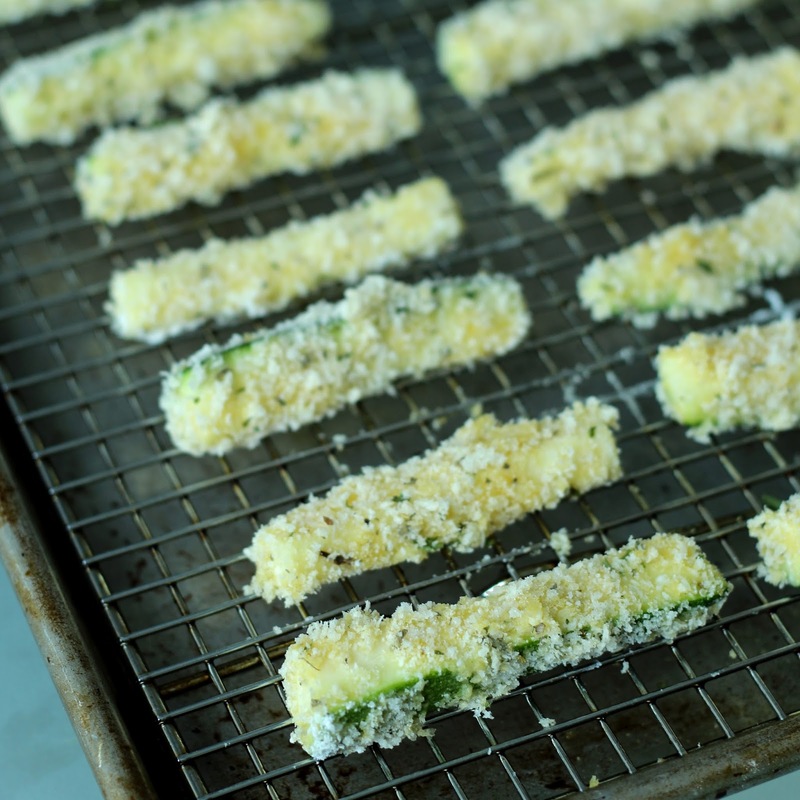 Place the zucchini fries on the prepared baking sheet. Bake in the oven until fries are golden brown and tender, 18-22 minutes. Cool and serve with your favorite dipping sauce like Ranch or marinara. Love your kitchen adventures! Besides, you might be working on Sienna's resume. Just imagine that '5 years experience in hiding ingredients'. Sounds impressive, haha! These zucchini sound impressive and look delicious too! Well done, ladies! I love how your daughter helps you out in the kitchen. I know what you mean about the mess, but the memories are worth a lifetime. I can;t wait to make these for my boys. So healthy too! How did it turn out with that? Debating if I should use mine or not…but I didn't like it on my chicken. My daughter isn't Sienna's age, but I still have a mess every-time I cook!!! GAH!!! 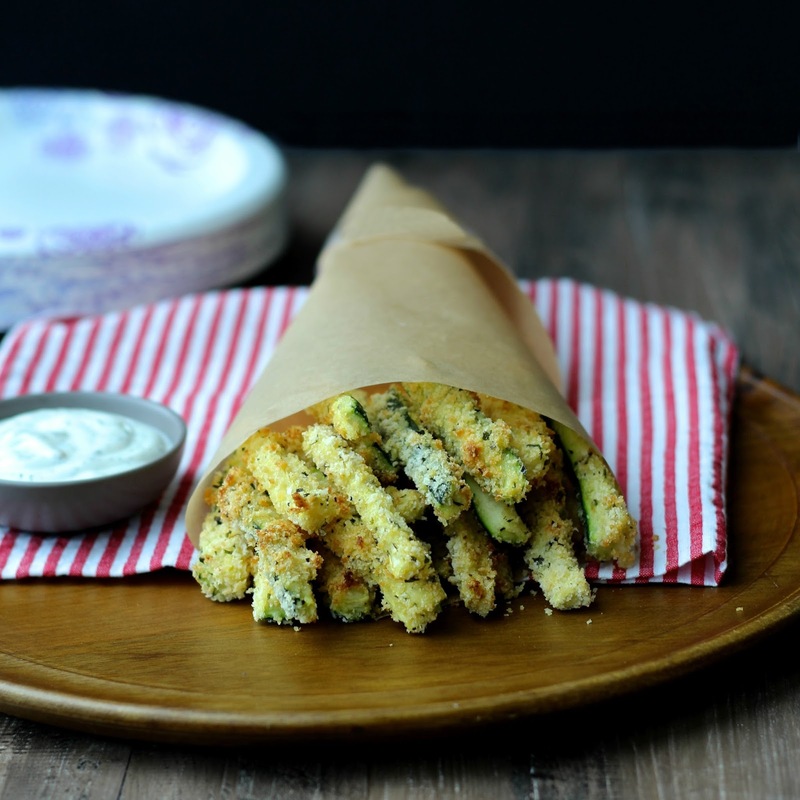 BTW – love these zucchini fries and LOVE the clean up after – thanks to Dixie! That photo for your little one is precious. I have a garden full of zucchini and my kids would love this! This reminds me of making fish fingers with my daughter. I'll have to try zucchini fries with her soon. Awesome recipe! And your little kitchen helper is adorable! I bet Joey and Sienna would be quite the sous chefs together! Oh my gosh she is so adorable!! I have a hard time cooking with my kids because of the mess it makes, admittidley. However – it is such a fun and memorable experience in the end, my daughter always talks about when we cook together and it really warms my heart. Seeing this post really gives me a nudge to slow down and make a little more effort. 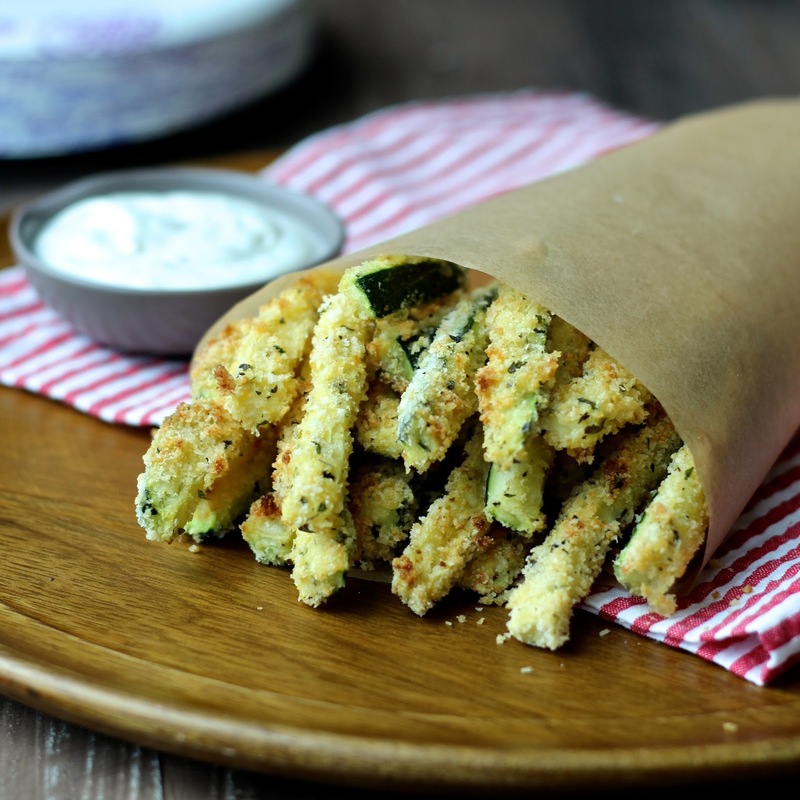 I love the zucchini sticks! A perfect way to get the littles to help and I think I may do just that since I have a bunch of zucchini and squash to use up! OK your daughter is so stinking cute!! And these look delish – I'm still getting zukes in my CSA – I wonder if these work with eggplant too? Sienna is so freaking cute!!!!!!! i havent made zucchini fries in a very long time, thanks for the reminder. These look delicious and I love the photos of your helper! OMG I have GOT to make these!!!! Looks delicious! What is the sauce that you have with it? It's this sort of pleasurable plus terrific practical experience all things considered, this princess continually speaks about when we finally cook dinner along but it seriously warms this soul.